Fermat's Last Theorem states that no three positive integers a, b, and c can satisfy the equation an + bn = cn for any integer value of n greater than two. 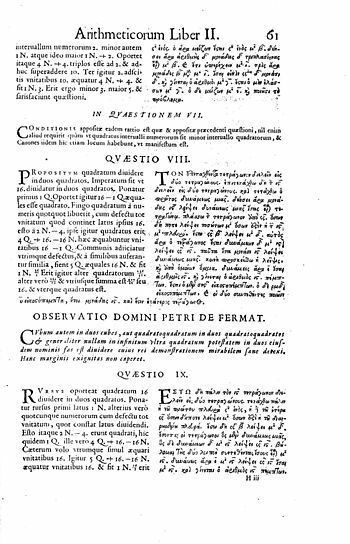 This theorem was first conjectured by Pierre de Fermat in 1637, famously in the margin of a copy of Arithmetica where he claimed he had a proof that was too large to fit in the margin. No successful proof was published until 1995 despite the efforts of countless mathematicians during the 358 intervening years. The unsolved problem stimulated the development of algebraic number theory in the 19th century and the proof of the modularity theorem in the 20th. It is among the most famous theorems in the history of mathematics and prior to its 1995 proof was in the Guinness Book of World Records for "most difficult math problem". 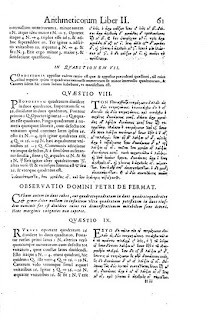 Fermat left no proof of the conjecture for all n, but he did prove the special case n = 4. This reduced the problem to proving the theorem for exponents n that are prime numbers. Over the next two centuries (1637–1839), the conjecture was proven for only the primes 3, 5, and 7, although Sophie Germain proved a special case for all primes less than 100. In the mid-19th century, Ernst Kummer proved the theorem for regular primes. Building on Kummer's work and using sophisticated computer studies, other mathematicians were able to prove the conjecture for all odd primes up to four million.